Due to the prominent rise of “anti-vaxxers” across the country, we are seeing a strong resurgence of measles outbreaks, a disease practically preventable through the use of vaccinations. Now, authorities at the University of California, Davis Hospital have issued a warning that at least 200 people may have been exposed to this infectious disease. Officials are saying a 7-year old girl was brought into the ER two weeks ago with symptoms synonymous with measles, according to Dr. Dean Blumberg, chief of pediatric infectious diseases at UC Davis. 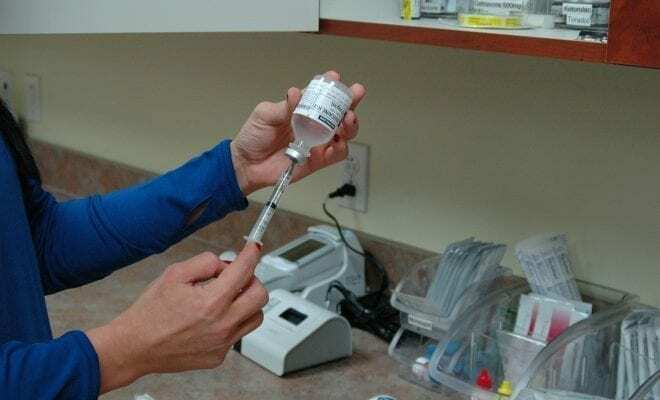 She said the child was exhibiting “some symptoms of measles, but not the typical textbook characteristics of measles.” Measles can be tough to diagnose quickly, as it starts out like many other common respiratory infections in children. Measles is classified as a highly infectious disease by the Centers for Disease Control. Infection begins with the sudden appearance of a rash and can be easily spread through coughing and sneezing, with the virus having the ability to live in the air for up to 2 hours. Symptoms include a moderate to high fever, cough, runny nose, and red, watery eyes. Some people can experience serious complications like severe pneumonia and encephalitis (swelling of the brain), both of which can lead to hospitalization and even death. Back in 2000, measles was considered to have been eliminated from the US, though it has made a resurgence due to a rise in popularity of the anti-vaccine movement. Measles is preventable by getting the MMR vaccine, which protects against it, in addition to mumps and rubella. Children are recommended to get two doses of the vaccine – one at 12 -15 months and the other at 4 – 6 years old.